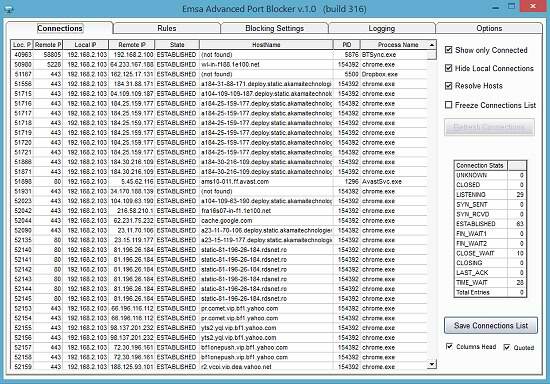 Emsa Advanced Port Blocker is an Internet port blocking utility, connection viewer, TCP monitor and logger.This program monitors, logs and even blocks access to ports in your computer or remote ports/IP addresses, based on your chosen user configuration. A lot of features available, including port ranges, IP ranges, combined rules, automatic DNS resolution, hostname-based blocking with wildcards, and much more. Lightweight, easy to use.This program is especially useful today, to keep track over connections and data being uploaded to third party servers, something that runs without us being properly informed and without our control. It comes to bring back to us this very much needed control over our own connections and data. It not only blocks unwanted - unneeded connections, freeing resources and a lot of network traffic, but also it logs everything for further analysis and insight by the user.Other features and characteristics: Fast blocking engine * persistent rules * detect and show processes attached to ports * advanced logging * export lists to file * freeze interface for easier view * multi-threaded DNS resolver * block all connections (panic mode) * block only new connections and keep established * autorun at system startup. Lockngo Professional encrypts and hides your entire removable media content using 64 bit military specification unbreakable encryption.Lockngo runs directly from the removable drive with no installation on the pc. Facebook Password Recovery instantly retrieves the login and password information user accounts of Facebook stored in IE7, IE8, Firefox 3.5, 3.6, 4.0, 5.0, Google Chrome, Google Chrome Canary, Flock, SRWare Iron, Comodo Dragon, RockMelt and more.